In any home, the bathroom is usually one of the smallest rooms, but one in which you tend to spend more time than you think. From showering and bathing to scrubbing and primping, that small room gets a lot of use. Everyone wants a bathroom that they feel comfortable in and that is an appealing place to spend time. Here are a few quick tips from us at Niagara on the Lake Realty to help give your bathroom that personal feel that won’t blow your budget. Probably the cheapest, fastest and easiest way to give any room in your home a complete makeover is to add a few coats of paint. You would be surprised what a new colour may do for your bathroom. Don’t be afraid to repaint the cabinets, drawers or other fixtures in the bathroom. Visit your local paint store for colour ideas or hire an interior designer to help you make the right colour choices. Another quick way to totally change the ambience of your bathroom for very little money is to replace a few items. It very well may be time to replace your bathmat, your towels and your shower curtain anyway. By changing these three items, you can quickly change the appearance of the whole bathroom. Your shower curtain takes up a lot of space in your bathroom so think of a curtain with a pattern, a texture or colour that will bring out the best in your bathroom. Try matching the towels and mat to the colours in the curtain for a uniform look in your bathroom. Your bathroom mirror is the other fixture in the bathroom that stands out. If you have just a glass mirror, consider adding a frame to it. Frames come in different thicknesses and colours. If you cannot find the colour that is just right for you, paint it! You will be surprised how much this simple frame will change the overall appearance of your bathroom. If you are just sick of the old mirror and do not mind spending a few dollars, perhaps it is time to replace it. Try thinking out of the box and maybe go with a round mirror or a mirror framed in iron or another decorative metal. Sometimes, the answer you are looking for is the simplest one of all. Perhaps your bathroom just needs a solid and thorough cleaning. A sparkling toilet, shower and counter all make a bathroom much more appealing. 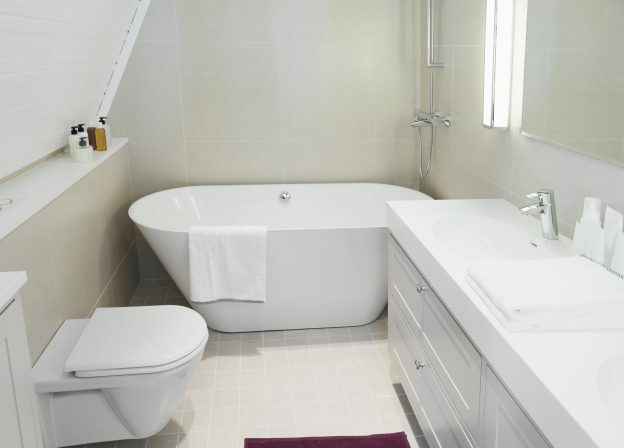 Book off an afternoon, roll up your sleeves and go in and declutter and scrub that bathroom until it shines. You may be amazed at the outcome. With these tips, we feel that you are sure to like your new and improved bathroom. A colour change or new towels, a new shower curtain or a mirror with a different and unique look will help transform your bathroom from ordinary to extraordinary. For more tips on making your house shine, especially if you plan on selling soon, visit our sellers page. This entry was posted in Blog, Uncategorized and tagged bathroom, Makeover, Remodel on May 22, 2015 by wp_admin.